Boris Johnson has said his comments about a British-Iranian woman "could have been clearer", but did not justify Iran increasing her jail term. 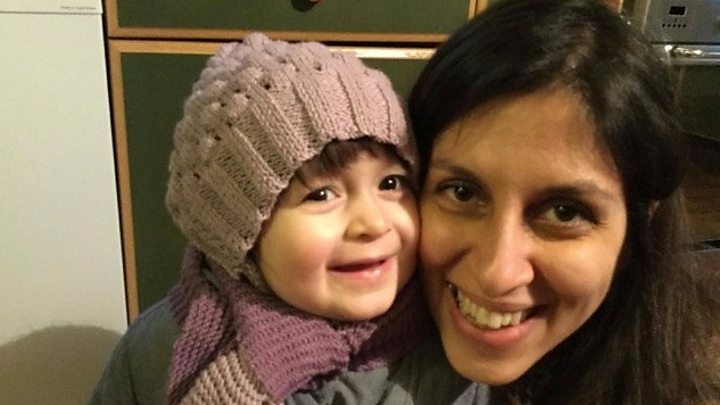 The foreign secretary had said Nazanin Zaghari-Ratcliffe, in prison in Tehran, had been training journalists in Iran.Her husband said Iranian officials were using Mr Johnson's statement to justify extending his wife's sentence.Labour said it was "unacceptable" but Downing Street said Theresa May had full confidence in Mr Johnson.Mrs Zaghari-Ratcliffe is serving a five-year sentence for allegedly plotting to topple the government in Tehran, although the official charges were never made public.Richard Ratcliffe maintains his wife's innocence, saying she was in Iran visiting family when she was arrested in 2016.She was summoned to court on Saturday 4 November where Mr Johnson's comment was cited as new evidence as to what she was doing in Iran.The Foreign Office said Mr Johnson now accepted he "could have been clearer" with his comments to the Commons Foreign Affairs Select Committee. In a phone call to Iranian foreign minister Javad Zarif, Mr Johnson said his remarks provided "no justifiable basis" for further legal action and he intended to visit Iran before the end of the year to discuss the case.He explained his comments had meant to make the point that he condemned the Iranian view that training journalists was a crime - not that Mrs Zaghari-Ratcliffe had been doing that. 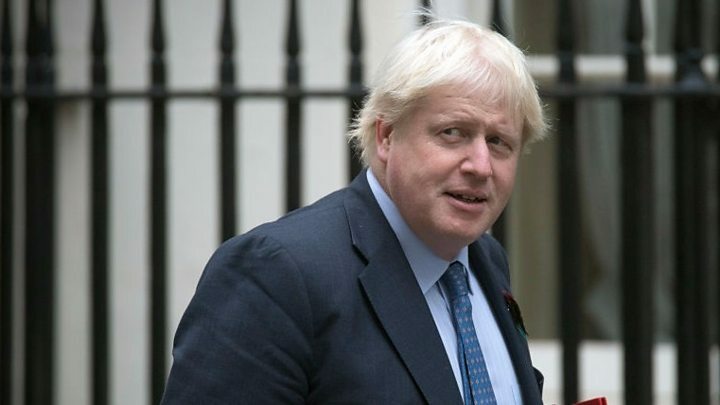 Mr Zarif told the foreign secretary the developments in the case over the weekend "were unrelated" to Mr Johnson's remarks, a Foreign Office statement added. International Trade Secretary Liam Fox told BBC Radio 4's Today programme that "we all make slips of the tongue", adding on Sky News that it wasn't "a serious gaffe".But Labour's Tulip Siddiq, Mrs Zaghari-Ratcliffe's MP, said Mr Johnson "needs to resign" if her constituent spends an extra day in jail because of his remarks. "A slip of the tongue in my books is swearing in front of your child by mistake - it's not condemning a British citizen to an extra five years in prison," she said.Mr Ratcliffe told the Radio 4's Today programme that Mr Johnson should make a statement in the Commons, retracting what he said.He added the "worst thing" Mr Johnson could do now was "suddenly go quiet and to create this problem without making any clarifications".He said he still hoped his wife and young daughter would be back home in the UK for Christmas. Liam Fox tells BBC's Today that Boris Johnson's comment about Mrs Zaghari-Ratcliffe was a "slip of the tongue"
Former Conservative Foreign Secretary Sir Malcolm Rifkind told the BBC Mr Johnson needed "to concentrate more" and "get the detail right".Mrs Zaghari-Ratcliffe was sentenced to imprisonment following a trial where she was accused of attempting to overthrow the Iranian government. She denies all the allegations against her, but lost her final appeal in April.She has since faced two more charges relating to an accusation of plotting to topple the government in Tehran.Mrs Zaghari-Ratcliffe has worked for the Thomson Reuters Foundation and BBC Media Action (the corporation's international development charity), but insisted the 2016 visit was so her daughter could meet her grandparents.However, appearing before MPs on the foreign affairs committee last week, Mr Johnson appeared to contradict that.He criticised Iran over the case, before saying: "When I look at what Nazanin Zaghari-Ratcliffe was doing, she was simply teaching people journalism, as I understand it. "[Neither] Nazanin Zaghari-Ratcliffe nor her family has been informed about what crime she has actually committed. And that I find extraordinary, incredible. "Four days later, Mrs Zaghari-Ratcliffe was summoned to court where the foreign secretary's comments were cited as fresh evidence against her.At the hearing, she was accused of engaging in "propaganda against the regime".The Iranian judiciary's High Council for Human Rights said Mr Johnson's comments "shed new light" on the charity worker and proved Mrs Zaghari-Ratcliffe "had visited the country for anything but a holiday".Mrs Zaghari-Ratcliffe had been eligible for parole under the early release scheme from 23 November.However, Mr Ratcliffe told the Press Association that she could now face a fresh trial before that date to block her chance of freedom. "I think the one thing the foreign secretary could do to make amends would be if he went to visit her in the next few weeks before her trial," he said. "Careless talk has a cost and there's been a lot of careless talk. "Monique Villa, chief executive of the Thomson Reuters Foundation, welcomed Mr Johnson's clarification and also said he should visit Mrs Zaghari-Ratcliffe in jail.